I won first prize at my work "Masterchef competition" today with my braised pork belly dish! In recognition of Harmony Day, my work social committee organised a "Flavours of the World" lunch. We were invited to bring a cultural dish to share and I thought I'd introduce my colleagues to delicious Taiwanese food. All dishes were entered into the competition, with prizes for 1st, 2nd and 3rd. I was asked for the recipe of the winning dish and while I already have a blog post on the traditional way of making it as per my mum's instructions, I've since changed the way I cook this dish. Given that not everyone has the kind of rice cooker I have, I thought I'd give it a go with the slow cooker and it worked just as well! Place the rock sugar in the slow cooker. Meanwhile, cut up the pork belly into large pieces (about 4 cm long). Rub the spice mix and the rice wine all over the pork belly pieces. Place in the slow cooker on top of the rock sugar. Drain and peel the hard boiled eggs. Place the eggs in the slow cooker, amongst the pork. (If you are using garlic, you can put it in at this stage). Pour the soy sauce into the slow cooker, over all the ingredients. Set the slow cooker to High for approximately 2 hours (I do this to save time, but you can put it on Low for a longer period of time). Then turn to Low for another 2 hours (or until the meat is fork tender). Occasionally turn pork belly pieces and eggs to marinate all parts. Be very gentle or the eggs will get damaged! (If you are using spring onion, you can add it in the last hour). Serve with steamed rice, (garnish with chopped peanuts and coriander) and enjoy! I'm currently holidaying in Taiwan and thought I'd take this opportunity to showcase the fantastic food Taiwan has to offer. First up - 極品軒 (Ji Pin Xuan) in ZhongZheng District in Taipei City. The interior was lovely. 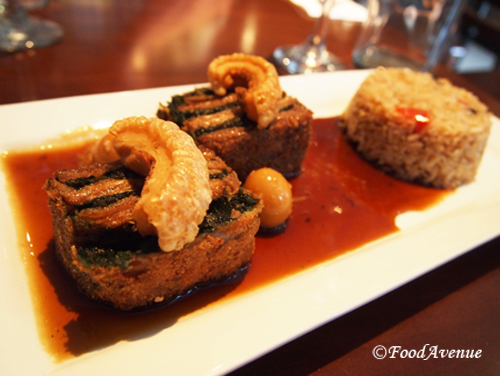 This is a very rich and flavourful braised pork belly dish. It was accompanied by a plate of sliced buns. When a piece of pork belly is placed between two flaps of bun, this is what the Taiwanese call, "虎咬豬" (Ho ka ti) translated as "Tiger bites pig". The pork meat was succulent, the fat was deliciously oozy and the skin was tender, yet had a slight give to it. The perfectly balanced sauce was thick and indulgent - a delicious rice puller! We couldn't not order a tray of 小籠包 (xiaolongbao - steamed bun filled with soup), as made famous by Taiwan's 鼎泰豐 Din Tai Fung restaurant. The pot on the left contained some cooking oil, which was added to the dish on the right (清炒鱔魚 Stir Fried Eel NT$428) at the table while it was still hot. The wait staff then stirred the dish to evenly distribute the oil, which released delicious aromas. Firstly, cut up and boil the pork belly. Meanwhile, hard boil some eggs. Then start assembling the ingredients in your rice cooker pot: pork belly, boiled eggs, chopped shallots*, garlic, rock sugar and soy sauce. Put the rice cooker on and let it work its magic! When the rice cooker ticks off, turn the pork belly gently to make sure it is completely coated with all of the marinade. You may need to put the rice cooker on two or three more times, depending on your taste. *I found out later from Mum that I was supposed to put the shallots in at the very end to retain the fresh green colour. And there you have it! Such a simple Taiwanese braised pork belly dish! Here is the full recipe. The amount and ratio of ingredients really depends on your taste. I kind of made up the amounts because I never really measure when I'm cooking! Cut up the pork belly into large pieces. Put pieces into a pot of boiling water. Skim off any scum that appears. Boil pork for about 15-20 minutes, or until pork is firm. Meanwhile, hard boil the eggs. Drain pork pieces and reserve liquid to use as a base for another dish (soup or whatever). Drain and peel the hard boiled eggs. Transfer the pork pieces and the peeled eggs to the rice cooker. Add soy sauce and rock sugar. Turn on rice cooker. 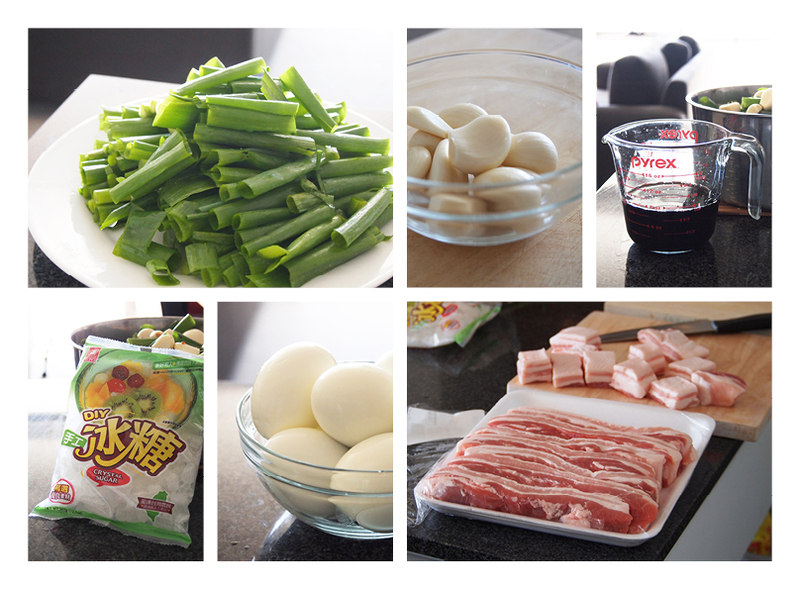 Once the cycle is finished, gently turn pork belly pieces and eggs to marinade all parts. It will probably need another cycle (or two) on the rice cooker. Add the spring onion before the last cycle.